So today I had a rather interesting little "problem". I had to replace a TV that sits in a cabinet, built from oak by a carpenter/joiner in the 70's. So with the new TV having significantly less of a frame and being much lower than the old one it was supposed to sit higher in the cabinet. I put in the shelf, of course it was a little to high to accommodate the TV - I needed to get it down by 6 cm - but then the shelf would sit on the hinges which doesn't work obviously. I decided to to make a cut out for the hinges on each side of the shelf and lower it as much as needed. The complete "Festool experience" makes me feel better and somehow gives me more confidence to do stuff I haven't done before. Last but definitely not least, the results I can achieve with Festool tools and the fact that I try for my results to meet the quality of the tools - which simply makes me work more accurate, but also, as already mentioned, makes me dare more and go further one step at a time. This cabinet is of unbelievable great value to me, one of the reasons I even kept that shelf that was not needed for years. It's not about money. Now this is a simple modification for most here and of course the professionals around us and might probably not even seem noteworthy to most, but I would have never thought I'd use my tools on this cabinet one day. But my experience with my Festool tools gave me the confidence I needed to do this. Making the cut outs for the hinges on the shelf. What I didn't take a picture of is my clamped down level that I used to guide the Carvex. This worked out perfect. Of course I used my trusty CTL-SYS with the Carvex. Here you can see the difference in cut quality. The cut out made with Carvex and the original, completely untouched cut above it. I'm currently thinking if I should maybe round of the edges of the cut out to match the front side of the shelf, but I'm undecided. Tomorrow I'll use some wax/polish to get off some residue from my Pica pencil's red wax lead. Then I drilled through the wall for the conduit to pass through. small Festool stack (CTL-SYS and SYS-PH on SYS-CART) on the roof. I needed to widen the first couple of centimeters of my 16mm hole to 18mm. After I had prepared everything on the 1st floor, I went down to the basement to beginn the conduit install and pull the cable. First fitting of the conduit on 1st floor, outside. Working my way up from here (basement). This is where the flush box will be. CAT cable and pull rope are now on 1st floor, inside. CAT? I assume these are like CAT-5 or CAT-6 8 conductor network cables, right? I wired my house for CAT-5e about 20 years ago but so much stuff is wireless now! Really enjoy your updates and tool selection! Yes, CAT-5e. The house is CAT-5e wired, but as with everything - sometimes you need just one more (direct/straight) line than you have/ can somehow connect. You're correct about the core's diameter, it's in fact 68mm. Perfect & ready to plaster. I just got myself the Stabila Electric Type 70 level. It also features neat drilling guides for outlets in the standard distances and I was missing a longer level for general stuff. But I definitely will have a look for the Kaiser, die to the compactness. Might be a good addition to the Festool one. Any thoughts on comparison, besides the possible drill size? Screenprint from stabila.com - (c) Stabila. Well the Bosch Professional GDE 68 is one of those accessories you need to try to actually "believe the magic". It's simply amazing and as great in collecting dust as the Festool one. I use both side by side. The Festool 500483 drill dust collecting nozzle for anything up to 12mm and the GDE 68 for anything larger. Of course the GDE works best wenn the drill bit is large enough to hit the bristles, but spillage is minimal even if it dosen't. And the Festool, if you have it, you know how great it is, especially while working over head it's a game changer. Just as the GDE when drilling those 68mm holes... Also it's larger brother the GDE 162 is worth every penny if you plan on drilling diameters larger than 68mm. Both have the two-chamber system, so even if the "drilling chamber" takes in additional air from a gap they will still stick to the wall. They have limitations: Clinker for example is a no-go. Then its all as good as it gets. Had a couple of these... Being busy anyway I took the opportunity to do this room once and for all. Now trying to source a new plumber to exchange the radiator/ heating element - as I don't have the means to temporary freeze part of the pipes to do this while the rest of the system is still running - and I don't feel like emptying the whole system, otherwise I'd do it myself. Hey Oliver, aren’t those Ridgid style pipe freezing machines available for renting? They are, I looked for one. But sadly not locally and that "kills" it for me, to much of a hassle. Let's continue the fun, shall we? First I "MacGyver-ed" a temporary outlet for the currently still needed phone/dsl copper wire that is going to disappear soon. Then the wire will go in the flush box and a neat lid cover it. Then more plaster work. Fine tuning around the flush boxes. In between two pictures of the finished conduit on the outside. Oh, and I just love this thing! Another day, another conduit. This time for an outlet that will supply power to the hardware needed for the switch of regular phone, internet and TV to fiber optic. Didn't get done much else except for phoning plumbers for the radiator/ heating element I want replaced. If I get lucky this get's done on Friday. 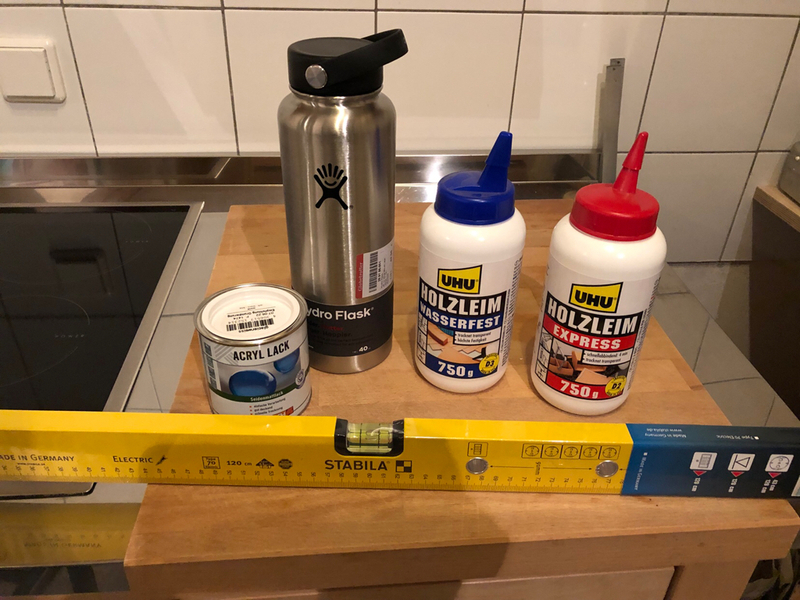 I also went to the hardware store to return some unused consumables. Just in case you ever wondered what a German distribution/ circuit breaker panel/ box looks like /can look like. There won't be any updates in the coming days, my new plumber called: he's sick. So no installation on Friday. But with some luck, todays appointment will be on Friday and installation sometime next week. Due to the angle of the picture, it is a bit hard to tell, but it looks as if that conduit runs downwards into the wall. If so, that could potentially lead to leaks. Connections like these really should always use 'droop loops' as wel call them, i.e. run the conduit a tad below the hole, then curl it upwards again. Rainwater will now fall from the low spot, and not creep into your wall. That is great advice, I hadn't thought of that possibility. Easily fixed, I will re-assemble that part and create a drop-loop! I love totally unexpected failures of electrical components! So I was getting ready to do the dishes, cranked up the hot water tab and filled the sink. When I checked, it was cold. So I tried again, still cold. Went downstairs, fumbled with the flow heaters setting, still nothing. That's when I called my electrician. Only got the lady on the phone who runs his office, he was supposed to call me back, still waiting. A couple of hours in, waiting for his call, I called the manufacturer of the contactor and got me some first hand information on the parts. So let's see what happens tomorrow. At least those of you who read this thread will benefit, there will be - hopefully interesting - pictures of the repair sometime soon. And while this isn't repaired, I'll boil water on the stove to do the dishes. Love oldschool. Best of luck! Hope it is only the water that stays cold for now. Could be worse. Joe do they say? „Switch fast, die young..“? Is that out of a tankless water heater? What was improper about the poor :hager install? Glad to report, NO need for Seppuku. It was installed by an electrician. out of the installation for them, yes. But not out of the water heater itself. Wrong phase connected to the load shedding relay which then gave inconclusive signal to the contactor and send it cycling. For my tankless water heater the load shedding relay was supposed to go on Phase 2 it was on Phase 3. Today was all about painting the ceiling (and installing a new ceiling light, I made a little video about the light which is quite cool but I have some trouble uploading it so that will have to wait for another day). "Moses, stop messing with the paint in the paint bucket"
I started the day by thoroughly cleaning the window, frame and windowsill with hot steam. Then it was time to prepare the paste. This stuff is quite good because it only needs 5 minutes to get ready.